Olmert embraces army: After emerging relatively unscathed from the Winograd report into the Second Lebanon War, Prime Minister Ehud Olmert issued a statement Wednesday saying he had "complete faith in the IDF, in its commander, in its soldiers and in its abilities." According to the prime minister, the Israeli army continues and will continue to train, improve, grow stronger and be prepared for any challenge and mission. The Prime Minister's Office did not comment on the criticism directed at Olmert by the Winograd Commission members, but said that the prime minister viewed the final report "seriously", just like he viewed the interim report. According to Olmert's associates, a series of discussions will be launched at by the government and by a ministerial committee in order to monitor the implementation of the report's recommendations. 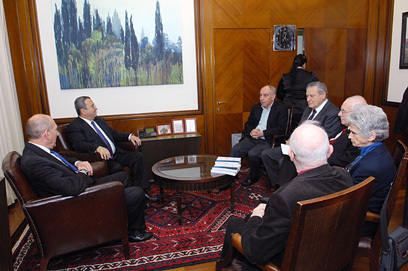 The Winograd Commission presented its complete report into the failures of the 2006 war to Prime Minister Olmert and Defense Minister Ehud Barak at 5 pm Wednesday, a year and a half after the Second Lebanon War and nine months after the publication of the interim report. The committee chairman, retired Justice Eliyahu Winograd, arrived at the Prime Minister's Office in Jerusalem to deliver the 500-page report to the prime minister and defense minister. The committee later held a press conference at International Convention Center (ICC) in the capital, and Justice Winograd read out the main parts of the report. The judge and the other four members of the governmental commission of inquiry - Law Professor Ruth Gavison, Political Science Professor Yehezkel Dror, Major-General (res.) Menachem Einan and Major-General (res.) Chaim Nadel – have listened to 75 witnesses and reviewed tens of thousands of documents since their appointment in September 2005. The witnesses included decision makers, politicians, officer, government workers and public figures. See all talkbacks "Olmert: I have complete faith in IDF"